Within the next few weeks, Google Lens will be launching as part of Google Assistant on Pixel phones in various parts of the world, including the UK. This is a huge step forward in terms of the way you are able to search in Google, and when it eventually rolls out to other devices, it will be another major change in the SEO landscape, just like Voice Search. What on Earth is Google Lens? As reported by Search Engine Land, Google Lens is an amazing new tool that allows the user to perform “visual searches”. In other words, you can point your smartphone’s camera at an object and use that viewpoint to search Google. How awesome is that? Based upon what we know so far, Google Lens is able to read text (such as business cards or product labels), understand and identify a variety of buildings and landmarks, and search for information found in artwork, books, and posters! It can even search using a barcode. This really depends on what you are pointing the camera at. For example, if you were to search for a barcode, Google Lens is able to find the product almost every time. It’s actually pretty reliable at doing this from the packaging as well, which is incredible. However, when it comes to buildings and landmarks, it still struggles somewhat, needing further improvement before it can be trusted to identify them accurately. This is also true for products that have no labeling on them. In fact, Search Engine Land even showed the results of their tests for the Google Home and an Apple laptop, shown below. 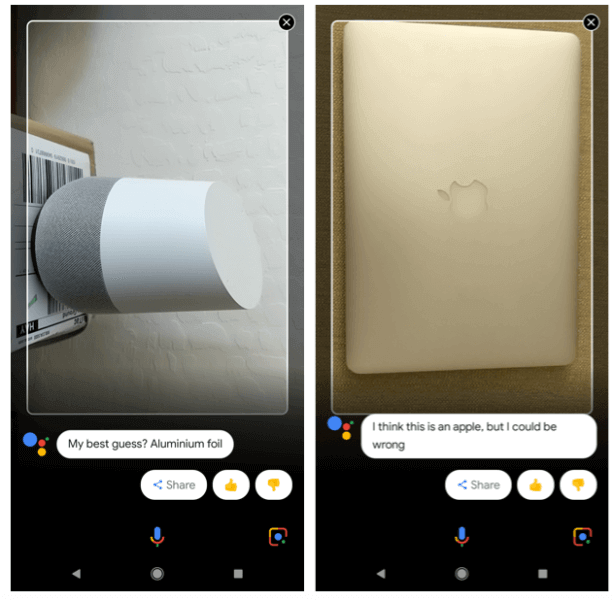 Google’s own assistant managed to incorrectly identify the Google Home speaker as aluminium foil, and identified the laptop as an actual apple, rather than the brand. Therefore, there is certainly room for improvement with the tool. However, it does show that there’s a massive change on the horizon when it comes the way people search. Well, that’s definitely the million dollar question, isn’t it? The fact that Google Lens is a visual search means that traditional SEO probably won’t have that much of an effect on search results. Instead, it might be best to try and build up your image optimisation, using well thought out, descriptive file names and alt tags. This, as well as ensuring that the content of the webpage is relevant to the product or object you want to appear for, will likely give you the best chance of making use of Google Lens. Whilst there aren’t any specific best practice guidelines known right now, by ensuring that you are following Google’s general guidelines, whilst also actively using schema markup for your products and imagery, you can probably hit the ground running. By using product schema to pass as much information to Google about your product as possible, you can help Google to identify it correctly. There are hundreds of options to use for schema, but when it comes to products, the following are the most important. Having this information will mean that Google will better understand your particular product, and be able to identify it when someone uses a visual search through Google Lens. On top of this, it will also means that this information can appear in Google’s standard organic search results, as well as being used in PPC campaigns. This includes Google Shopping, which we have seen to be one of the most successful types of campaigns in terms of ROI. Therefore, getting schema installed on your e-commerce website is a must! In fact, it is the same for a gallery website or a business that offers services. As mentioned previously, there are hundreds of different types of schema. Thus, it is highly recommended that you find the right one for your website and get it installed. You may recall how big everyone thought Google Goggles were going to be, and how they amounted to almost nothing. And because of that, you might be thinking that there really isn’t any point in worrying about Google Lens. Well, times have changed and technology has moved on since the Google Goggles came out, and it certainly looks as though Google are trying really hard with the Lens. Whilst even Google admit that, for now, the Lens is better suited to specific tasks (see this blog post), they are planning to improve it and add new functionality. Therefore, it is unlikely that Google Lens is just a fad that will be going away as quickly as it came about. Instead, this is likely to replace traditional, text-based searches within the near future, and may even eclipse the recent release of voice search too. It’s best to prepare your website for the likely event that Google Lens is here to stay! If you’re concerned about implementing schema onto your website, or about what the release of Google Lens means for you and your business, then feel free to get in touch and we’ll be happy to run through what is needed to get your website ready for the future of search. Black Friday - Google Adwords - How do I make profit?